As part of Hamilton Pride Week | 10 Years On | Finding our History – the amazing Shaynah is hosting Queer Writers Read Things at Nivara Lounge! Allies welcome to submit their readings or come along to listen and support queer artists. So Come along to celebrate queer literary voices and if you’re keen on reading something, let us know! Submissions of all kinds are welcome; poetry, prose, or whatever you’re into! 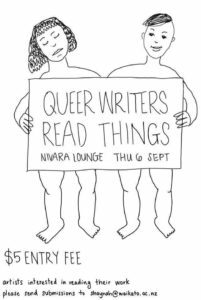 Queer writes read things | Thursday 6th September | 7pm – 9pm | Nivara Lounge | $5 Entry | See you there!